HAO STATS white multifunction grinder Colloid mills（Grinder） grinders, pumps of this series of products have a utility model patent, the structure of tight playing, novel shape, the overall compact, environmental protection and energy saving. HAO STATS white multifunction grinder Colloid mills（Grinder） grinders, pumps of this series of products to implement the national standard GB / T 14466 and SINOSTARS enterprise standards Q/WSS01-2004, an internal initiative. HAO STATS white multifunction grinder Colloid mills（Grinder） grinders, pumps of this series of products and electrical steel paint rack. Wa, Wa-2 series of body parts with the material contact parts are stainless steel. HAO STATS white multifunction grinder Colloid mills（Grinder） grinders, pumps of this series of products: grinder Wa, Wa-2 colloid pump JP-W, JP-W-2 series of the main parts of the use of stainless steel material; Dioxide movement grinder, grinding, colloidal pump stator and rotor contact with the material components used are high-intensity and high-alloy steel with special hard material, in this series since 2005, has only been at home and abroad has been successfully applied to large-scale Preparation of Titanium and transmission in high-grade titanium dioxide color. 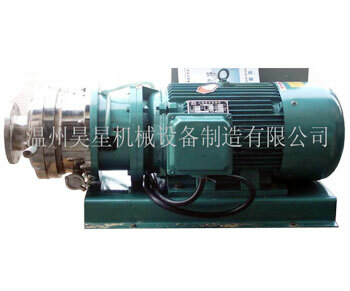 HAO STATS white multifunction grinder Colloid mills（Grinder） grinders, pumps of this series of products with horizontal motor, motor Siamese body with the axis of rotation with the structure. So that horizontal Colloid mills（Grinder）; use of piped connection method: flange, Lo I, quick clamp, quick access live pipelined thread COLLOID MILLS said. HAO STATS white multifunction grinder Colloid mills（Grinder） grinders, pumps of this series of new product design, operation using a simple, convenient installation and maintenance, small size, high efficiency. HAO STATS white multifunction grinder Colloid mills（Grinder） grinders, pumps of this series of products for the ultrafine particles of wet grinding, grinding, emulsifying, mixing, dispersion, homogenization, mixing and other high-performance features. multi-functional grinder 7Stars Colloid mills（Grinder） this series of products applicable to all types of emulsion liquid medium paste materials, processing and transportation of materials density viscous medium 5000-10000 cps. HAO STATS white multifunction grinder Colloid mills（Grinder） grinders, pumps of this series of processing materials in accordance with the customers of different acidity, alkalinity, thick nature of the special requirements of the degree of customization. HAO STATS multifunctional grinder Colloid mills（Grinder） titanium dioxide, colloidal mills Colloid pump can transport the product titanium dioxide slurry (titanium dioxide,TO2), synthetic resin, chemical synthesis, suspended solids, pastes, such as grinding, emulsifying, mixing, crushing, homogeneous and supporting transmission pipeline.